In the world of Neverland, humans and monsters live alongside each other. Generation of Chaos details the start of the adventures of the two heroes of Neverland, Chiffon and Roze. Chiffon is a boy with the power to train monsters. After realizing that his power is waning, he sets out to Hiyoko Forest to return his Hiyokomushi—a fish-like mount and companion—back to its homeland, the Hiyoko Forest. However, the journey there is anything but uneventful as his control over his monster gradually loosens. Roze is of half-demon descent, living a quiet life among humans with her sister Emilia. One day, as Roze returns from work, she sees her house being set on fire.The destruction of her home shatters her dream of being able to live peacefully with humankind, as she is reminded that harmony between demons and humans is far from becoming a reality. These poetic sentences come from Generation of Chaos: Prologue, a show brought to us by the great Idea Factory which created Mars of Destruction and Tenkuu Danzato Skelter Heaven. Like other Idea Factory works, it is supposedly based on a strategy role-playing game the studio made. 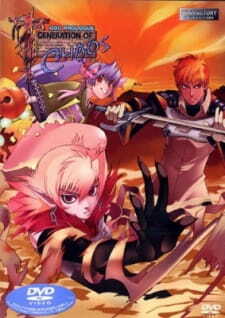 This anime is created before Mars of Destruction and it is good to know that Idea Factory sucked before as well. As this OVA is meant to introduce viewers to the Generation of Chaos world, I begin to take notes of the setting and characters. I gather that the work is similar to the Monster Rancher series, though this may be too good for a comparison. There are three segments to the show: Chiffon is a monster master whose voice cannot reach to his monsters because he is too old. Thus, he embarks into an epic coming-of-age story. Another segment is about a runaway demon who knits silk to feed her sister. The last segment, after the ending credits, is about the history of the game’s setting, character profiles, and an advertisement for the game; I am amazed by the usage of filters in this segment. If these sounds like a fantastic stories worthy of praise from Miyazaki, this is because they are. The art consists of character designs that look ripped from the video game placed onto backgrounds and floors coming from Nintendo 64 games, speed lines, and unimaginable delights. Some of the character’s emotions are plain humorous; it is amazing that Idea Factory approved this work. The voice acting is tolerable except for the knight in the second segment; I have no comment for the knight’s seiyuu. The female narrator at the end is one of my favorites for being overdramatic for a game advertisement. However, the real kicker for sound is the repetitive usage of music. People who have watched Mars of Destruction and listened to their usage of Beethoven and Satie will know what I am talking about. The music feels loopy and surreal; there is a musical piece that is played on an organ and it feels like a five year old composed it. Never has the music feel so generic. Poor Mizuki Nana. She is a fantastic singer and her opening and ending themes show. I pity her for her credit in this work. Whoever added her into the credits of this work should be ashamed. It is unfair to judge this work through the criteria of an actually good show. Instead, I shall factor in more of the enjoyability factor. Did I enjoy the show for being stupid and idiotic? Yes. However, is the show more special than Mars of Destruction or other so-bad-it's-good works? No. The work feels too generic for me to like. In the end, my mouth is gaping more than laughing. Mars of Destruction fans, so bad it’s good fans, and masochists will enjoy this work without a doubt like I did. There is potential to make good riffs on the work. However, to those who are not big fans of bad works should stay away; a work like this can make someone terribly insane. Another day, another terrible Idea Factory OVA. Well, since I reviewed Mars of Destruction and Skelter + Heaven, I might as well get this one out of the way. The plot to Generation of Chaos, as far as I can tell is basically what would happen if you took the main mechanic of Pokemon, had it be used for creatures more akin to Digimon, and put it in a universe of a generic version of The Slayers. However, this feels less like an OVA meant to accompany a game and more like the prologue to an actual anime. That never got made. The animation is by Idea Factory, and it is easily some of the most atrocious I've seen. And I know the animation is dated, but even at the time it came out, it still was terrible. Mainly because Excel Saga started to air at the same time, and it had animation that was a million times better than this show. Also, the CGI is atrocious, but at least they have an excuse here - CGI was still new to anime, and as such, it was easy to screw up. The sound was...decently mixed, but extremely forgettable. And I can't really say much more. The characters are either generic or forgettable - Chiffon (our main lead) falls in the former category. I would go into further detail about the rest of the characters, but they were so forgettable that I couldn't even tell you what they looked like. The worst part about this is that it's not even funny to watch - at least with Mars of Destruction, you can do a group watch and MST3K the whole OVA. This isn't even "so bad it's funny" territory. Generation of Chaos is something I expected to be bad, but was somehow much worse than I thought it would be. There being two stories in it that are completely unrelated makes so little sense to me with the runtime. This means that the plot of the second half is so badly executed and confusing yet so cliched at the same time it is hard to get through - even though it's less than 10 minutes long. The first half is the reason this isn't a one: although a Pokemon rip-off in a lot of ways, it does give a unique spin on the formula. However, it is too overt in it's friendship message (that is pretty hard to see due to no interaction) and a lot of details feel very unnecessary to what is being told. Off model characters, bad 3d backgrounds, designs that are forgotten 3 minutes after watching it, janky and there isn't much more to say. Bad. Can't remember any music, some of the voice acting is too over the top and the voice of the knight feels very unfitting. Two of the characters (of whom I can't remember the names of) from the first half have no point of being in the story. They provide little in the way of humour or plot development and could honestly have been left out. All other characters in the stories feel there just to be there, for things to happen to them. You do not learn to care for any of them. You do not see how they change in any way. They don't even really have traits (plural). They are as flat as paper. Confusingly bad. Not so bad that it's funny or good enough to say "huh that was OK". A large world story seems abridged into this montage OVA. 1st half is blue hair boy & a Pokemon, cringe comedy, flashback, & random timeskip. Lots of dragged on pacing. Euphemistically, it's a about coming of age, retirement, & farewell. 2nd half follows Roze oneesan, a typical tragic betrayal backstory, causing a change from salarywoman to knight. A loom working sequence seems accurate, but super long. In both weird side characters tell mc a random aphorism. Ok for 2001, some wonky/lazy animation. Roze has some better drawn designs. Some corny bad ost/effects. It's saved by a very soothing ED (Let's Look to the Sky by Mami Kingetsu). OP was fine too. Messed up pacing & editing destroys the 2 slightly interesting character backstories. ED is its saving grace. Good Roze design. Somewhat funny mixed with cringe.